^ Lambermont, Paul Marcel; Anthony Pirie (1970). Helicopters and Autogyros of the World. Barnes. pp. p. 37. Coates, Steve and Carbonel, Jean-Christophe. 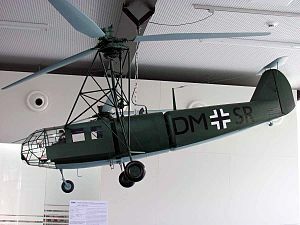 Helicopters of the Third Reich. Crowborough, UK: Classic Publications Ltd., 2002. ISBN 1-903223-24-5. Nowarra, Heinz J. German Helicopters, 1928-1945. Atglen, PA: Schiffer Publishing, 1990. ISBN 0-88740-289-5. Polmar, Norman; Floyd D. Kennedy (1981). Military Helicopters of the World: Military Rotary-wing Aircraft Since 1917. Naval Institute Press. ISBN 0870213830. Smith, J. Richard and Kay, Anthony. German Aircraft of the Second World War. London: Putnam & Company Ltd. 1972 (3rd edition 1978). ISBN 0-370-00024-2.